I thought it would be interesting to compare my daily routine here in Spain to the one I will have in Japan starting in April 2009. As the title says, this post is about my food and work in Spain :D. Once I'm in Japan for some months I will make the comparative. Normally I have some sweet breakfast with milk, nesquik and biscuits (on the left of the picture) at around 8:30. Lunch is around 14:50 and I usually have two dishes. In the picture, the first dish would be "Patatas a la Riojana" (right) and the second dish is chicken with ham and cheese inside (left). I use a fork and a knife as you can see and I drink water. I like to eat bread in the lunch, especially with the first dish. 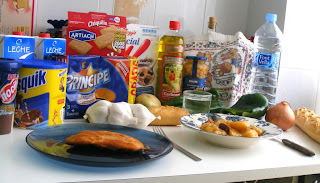 In the picture, you can also see some typical ingredients of the Spanish cuisine (olive oil, onion, garlic, potatoes, peppers). 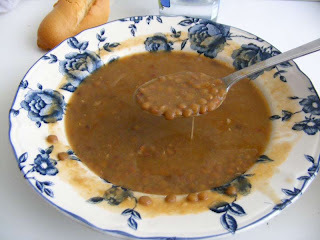 Here we can see another typical dish in Spain: "lentejas" (lentils). 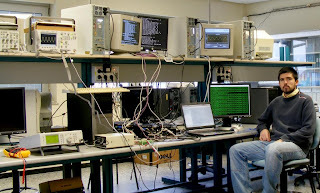 And this is my work office, a laboratory in the University of Cantabria. Normally I work 9:30 - 14:20 then I go home to have lunch and then I come back to work again 16:15 - 20:30. However I have some flexibility because I can enter to the building with an electronic card even when it is closed, so I can work on a weekend or do extra hours and then take some week days off. The important thing is that I manage my time well so I can do my work in time and meet the project deadlines. 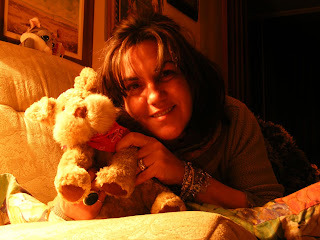 And this is my mum, who prepared the "Patatas a la Riojana" haha, and asked me to appear in my blog (maybe she wants to be famous hehe :D).